As we enter the latter half of July 2017 we can think back to a day 199 years ago, when a Cornish woman and an Irish man were awaiting the birth of their fifth child – Emily Jane Brontë. This waiting, and on the 30th of July the birth, didn’t happen in Haworth however, but in a moorside village seven miles away: the birthplace of the Brontës, Thornton. Patrick and Maria Brontë moved to Thornton in May 1815. Reverend Brontë had moved to Thornton because the curacy came with its own parsonage, something he hadn’t had at his previous parish of Hartshead, where he instead rented a property at Lousy Thorn Farm. It’s hardly a name that inspires confidence in a property, so the Brontës would surely have welcomed the opportunity to move on. There was another factor that made the move so important – the Brontë family was growing by the year. By the time Patrick and Maria arrived in Thornton they already had two daughters, Maria junior and Elizabeth, who were both to meet a tragically early end after being sent to the notorious school at Cowan Bridge – later recreated as the infamous Lowood in Charlotte Brontë’s ‘Jane Eyre’. Further children arrived at regular intervals. Charlotte was born in April 1816, and in June 1817 she was followed by what her parents would have viewed as a particularly happy event: the birth of a son Patrick, who would be forever known by his middle name Branwell. In July 1818, another daughter was born and she was christened Emily Jane. Finally, on January 17th 1820 the final Brontë child was born, a sweetly smiling little baby who would be named Anne after her maternal grandmother Anne Branwell (formerly Anne Carne) of Penzance. Thornton Parsonage had served its purpose for a while, but it was by now increasingly unsuitable. As well as being a brisk walk away from Patrick’s chapel itself, the chapel that became known as the Bell Chapel after Patrick had a bell tower erected, the mid-terraced house was now home to Patrick and his wife, their six young children, and two servants. It was clear that somewhere larger was needed, and Patrick, never a man shy of writing a letter, wrote to his Bishop to let him know. In his letter he referred to the parsonage as a “very ill constructed and inconvenient building.” Fortune was soon to play its hand again, and just three months after the birth of Anne Brontë, the family was to move again, to their final location of Haworth. As Patrick walked alongside the carriages ferrying his family across the moors on 20th April 1820, often with Anne or Emily on his shoulders, he must have been full of hope, and full of love for his young family. Little did he know that less than 35 years later he would be the only Brontë left alive. So what became of that ‘ill constructed and inconvenient building’? Happily, it is still standing today, on the middle of Market Street looking out onto the moors around Thornton, and it’s well worth a visit. What was once the parsonage is now a beautiful café and delicatessen called ‘Emily’s’ offering high quality local food as well as specialising in the flavours of Italy. I’m also told that they serve scones to savour on Sundays. 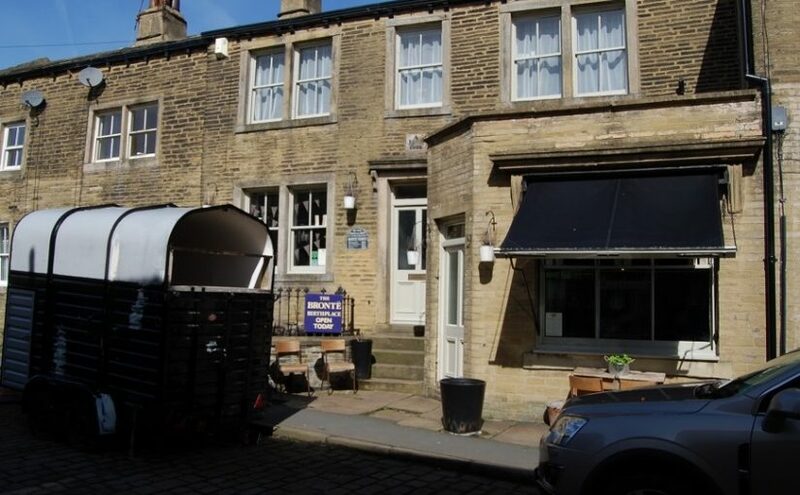 A sign outside the parsonage turned delicatessen rightly proclaims it as the ‘birthplace of the Brontës’, and a plaque on the wall gives the dates that the four children were born there. 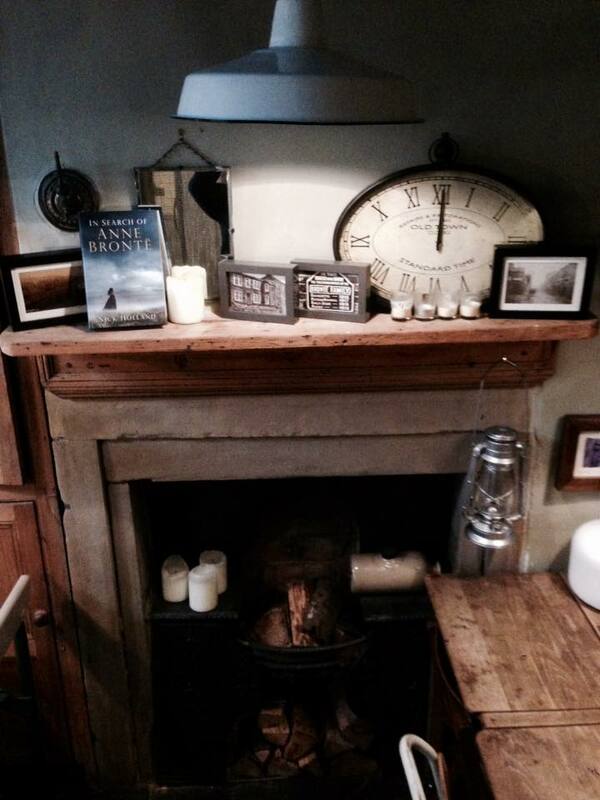 Inside are portraits of the family, alongside the books they wrote, and Brontë memorabilia. One particular treasure is the actual fireplace that stood at the time, and by which the children themselves were born. Imagine how thrilled I was to see my own book, In Search of Anne Bronte, atop the very fireplace by which Anne came into this world. The proprietor, Mark de Luca, told me that upstairs in a bedroom is also a desk that belonged to the children. On taking a picture outside, a group of young Thornton-ites asked me why I was photographing the building. 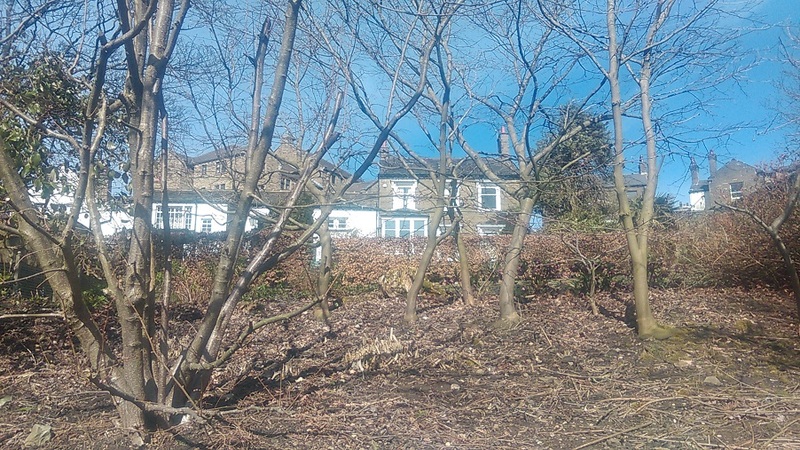 I explained that it was because it was the home of the Brontës. ‘Oh’, said one of the group, ‘ just wondered because everyone takes pictures of it’. Anne would have been proud. Thornton is an essential part of the Brontë story, but it’s a fascinating and beautiful village in its own right. 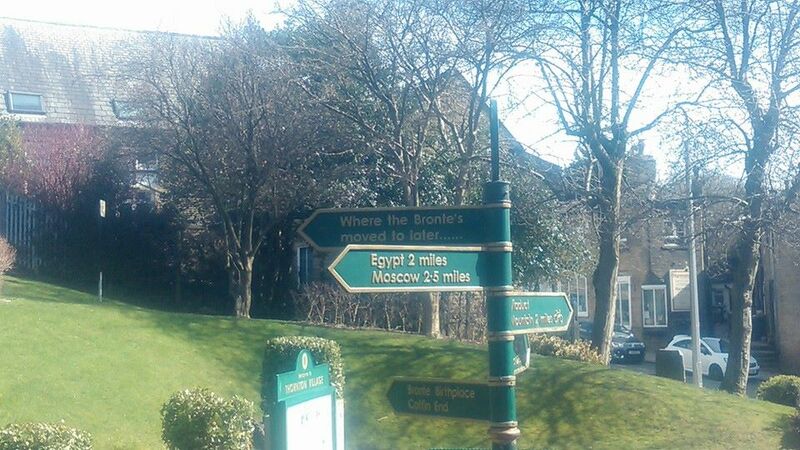 In this post you’ll see pictures of the rather confusing signpost showing where the Brontës moved to (I’m not sure if the distances are correct, and I’m certain the apostrophe is out of place), and Kipping House in Thornton, home to the Firth family and Anne’s kind godmother Elizabeth Firth. Later Elizabeth Franks, Patrick unsuccessfully proposed to her after the death of his wife Maria. 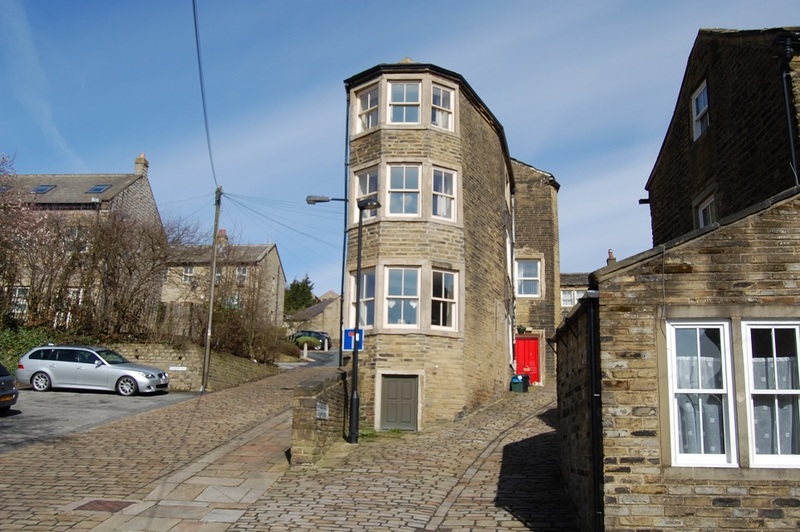 Another fascinating building is the narrow house pictured below, at the very end of Market Street where the Brontës were born. Now called Coffin End, it was once an inn that on occasion had men wrestling bears. Don’t worry if you visit Thornton today, the bears are long since gone. I don’t think Anne would have been proud of the current state of public education in her birthplace.